We feel immensely pleased to offer an exclusive gamut of PP Repair clamp to our esteemed clients. Use for repairing pinhole leaks, punctures, and splits. Drop-in bolts allow easy installation. Ductile iron lugs and carbon steel nuts and bolts. Diameter: 1/2", 3/4", 1", 1 1/4", 1 1/2", 2", 2 1/2", 3", 3 1/2" , 4" , 5", 6". We deal in all types of Pipe Repair Clamp . In order to meet huge market demands, we are involved in offering utmost quality of Mechanical Pipe Repair Clamp. 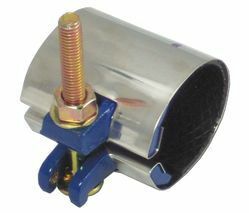 This Mechanical Pipe Repair Clamp is frequently used for repair of longitudinal cracks in DI/CI Pipes. Our products are of standard class quality. The AVK Series 729 single plate repair clamp is ideal for repair of cracks, holes and open joints in pipes of steel, concrete, cast iron, asbestos cement and synthetic materials. Pipe repair clamps are the best solution available to prevent the leakage in pipe which can be installed single handedly in a short duration of time. Pipe repair clamp shells are made from suitable thickness stainless steel sheet of suitable grade and thickness which is capable of providing uniform pressure over the damaged part of the pipe. It is used to Clamp the Ofc Cable Pipe for repair of Damaged pipe.It is Clamped with the help of 4 nos of M6 x 35 Hexagon Bolts.We have ready stock of this product and it can be delivered immediately. With firm commitment to quality, we manufacture and supply a wide assortment of On Line Pipe Repair Clamp. Jiffy™ M.S. Patch Clamps are used for repair of longitudinal cracks in DI /CI Pipes. The Clamp has a Rubber Tray which encases longitudinal cracks for instantaneous repair. Sizes available from 80 mm to 750 MM dia. Available Straub or equivalent make pipe repair Clamp. We offer Straub pipe repair clamp to our clients . 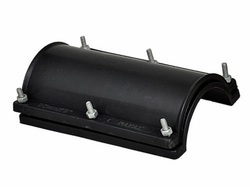 With desire to cement our reputation in the market, we are engaged in offering an excellent range of PVC (Poly Vinyl Chloride) Pipe Repair Saddle. Keeping in mind the set industry standards, the offered saddle is precisely manufactured by our adept professionals using premium quality ploy vinyl chloride and advanced technology. We are the leading manufacture of Repair clamp.